The French Government, has contributed to Ambae humanitarian Response plan, by funding and delivering 3 tons of Non Food Items (NFI) to the Vanuatu Red Cross Society through the French Red Cross operating in Vanuatu and the logistic means of the Army Forces in New Caledonia.. This contribution has been implemented within the FRANZ (France, Australia, and New-Zealand) framework agreements, which aim to support Vanuatu government to manage natural disaster aftermaths. Last month, the Vanuatu Government through National Disaster Management Office –NDMO has sent a request for assistance to the FRANZ unites and the Vanuatu Red Cross Society, as a leading humanitarian actor in Vanuatu, and which is also working closely with its partners such as French Red Cross. The French Red Cross is in country since 2006, with around twenty projects implemented so far in the fields of WASH and Disaster Management, including emergency responses to 2015 TC PAM and Ambae Volcano eruption in October 2017. On Saturday 12 May 2018, a CASA plane from the French Air Force landed at the Port Vila International Airport with international supply from French Red Cross warehouse in New Caledonia, funded by the French Government as participation to Ambae disaster response, amounting 10 million VUV. The French Government contribution is to address the needs for 150 displaced families or around 750 people through the provision of Non-food items and emergency shelter assistance. In addition, up to 100 hosting families may be supported as well to facilitate the integration of the evacuees to their resettlements sites. The supply from the French government was coordinated by the French Red Cross Delegation in Port Vila, led by the Country Director, David BOISSON, in conjunction with Vanuatu Red Cross Society and the French Embassy in Vanuatu.. The international supply is comprised of 150 family kits that include kitchen set, shelter set, sleeping mat and tarpaulins. Also the French Government is also looking at locally purchasing 1000 other NFI (blankets, jerry cans…) to be distributed by Vanuatu Red Cross Society to 150 displaced households and up to 100 host families, according to further assessment on relocation sites. The International Federation of Red Cross and Red Crescent Societies (IFRC) has released over thirty million vatu (VT30,000,000) from its Disaster Response Emergency Fund to support the Vanuatu Red Cross to reach up to 5,000 people, affected by Ambae Volcano eruption. “The Vanuatu Red Cross operation will aim to assist people permanently relocating from Ambae to transition to their new location and begin to rebuild their lives.” says Jacqueline De Gaillande, Chief Executive Officer and Disaster Management Coordinator of Vanuatu Red Cross Society. The emergency funding will support approximately 5,000 people – up to 1,000 families – with water, sanitation and hygiene support, materials for emergency shelters such as tarpaulins and shelter tool kits, household and personal items, as well as water containers. Having access to water is a wish for many remote rural communities in islands across Vanuatu, like on the island of Gaua in Torba province. In 2012, Vanuatu Red Cross, with the support of USAID and the Red Cross, responded to a petition from the North East Gaua community requesting assistance with their water supply, as it was a big challenge to their lives and livelihoods. Mrs Pauline Atkin from Gaua volcanic island had to walk more than 2.5 miles a day to bring water to her seven children. When there was not enough water, Pauline had no other alternative than collecting heavy coconuts to provide drinking water for her children, a demanding task. As Pauline said, other villagers had planned to bring water from this spring to their coastal villages for many years. Even though they had a workforce able to build a water gravity system, they lacked technical knowledge and materials such as pipes, tanks and taps. They sent a request to the Red Cross – USAID funded project, which has been implementing such construction of water gravity systems since 2012 in Vanuatu. Pauline and the villagers dug 8 miles of trench in the jungle with shovel and pickaxe. They installed pipes under the guidance of water engineers, in order to build a strong and durable system. They elected a water committee, made up of women and men from the community, who have been trained (on topics such as plumbing or water community policies) and are responsible for the maintenance and management of the new water system. Pauline can now easily access water; she is no longer drinking coconuts because she needs it but because she likes it. “Now that we have this new water system, it makes life much easier for us. We no longer go far away to fetch the water; instead we walk a few feet from our house”. Pauline is one of the thousands of people who have benefited from the USAID-supported projects to access water in Vanuatu. Under this framework between 2012 and 2018, more than 30 miles of pipe trenches have been dug by hand. Communities were also mobilized for local material collection (such as sand, gravels and rocks) and the transport of thousands of bags and pipes. Barry Wobur, the local Area council secretary responsible for the development of this island, said this program directly benefits the people, allowing them to improve their daily life and their health. It also strengthens the community’s resilience and shows them that they have the ability create a better place for the next generation. Vanuatu Red Cross Society helping affected population on Ambae island. Vanuatu Red Cross Society (VRCS) management team has met this morning to immediately revisit its ongoing response operations plan, after the declaration of the State of Emergency” on the island of Ambae by the Vanuatu Government, on Thursday this week. “Our priority now is to make sure that the most affected people on the island of Ambae are equipped with masks, safety glasses and other essential items as part of our Health & Safety kits. We have mobilized our volunteers on the ground, to start distributing over 800 of these kits immediately; also to liaise with National Disaster Management Office to begin sending over donations that have been collected as part of our appeal ” said Madam Jacqueline De Gaillande, the Chief Executive Officer of VRCS. The ash fall from Lombenben Volcano activity has increased significantly in recent weeks and the Red Cross branch in Ambae are continuing to respond to people’s basic needs. One of the main actions launched by VRCS since the double disasters of ash fall and flash flood or Lahar, in Ambae, has been the public appeal for donations. VRCS is calling for people to donate clothes, beddings and kitchen utensils to the appeal. VRCS is also accepting cash donations. “All donations should be made at the Red Cross Headquarters in Port Vila, or in Red Cross Branches located in the provinces because we have a recording process in place. Unfortunately Vanuatu Red Cross cannot accept food donations. If people have food they would like to donate, they could instead sell it to raise funds which can then be donated to Red Cross to assist the Ambae population ” explained Mme De Gaillande. All cash donations should be made directly to the Vanuatu Red Cross Finance department. VANUATU – Forty four police (VPF) and para-military (VMF) officers participated in a four- day training seminar in Vanuatu on International Rules and Standards for Policing which was facilitated by the International Committee of the Red Cross (ICRC) for the Vanuatu Police Force. The training seminar which was conducted by the ICRC’s Regional Delegate for Police & Security for the Philippines and the Pacific, Mr. Anand Appadoo, was held from 6th to 8th November for 20 police officers in Port Vila and from 9th to 10th November for 24 police officers in Santo. The seminar focused on arrest/detention, search and seizure, use of force and firearms, crowd management and root causes for behaviour in situations of violence. The Vanuatu Police Force had requested the ICRC to provide training for its officers who will be involved in providing security during the Mini Pacific Games which will be hosted in Port Vila in December. The first day of the seminar was opened by the Vanuatu Police Commissioner Mr. Albert Nalpini who thanked the ICRC for taking the time to provide this valuable training which his police officers will greatly benefit from. He said the training is timely and prior to Vanuatu playing host to thousands of athletes who will convene in Port Vila next month to compete for the Mini Pacific Games. In closing the two-day training in Santo, Assistant Police Commissioner and Commander North Mr Willie Samuel thanked the ICRC for the training session which in his view is very useful and would help the officers in Santo when they will support and doing their duties during the Mini Pacific Games in Vila. Closing of the workshop at the Maritime college in Luganville, Santo. 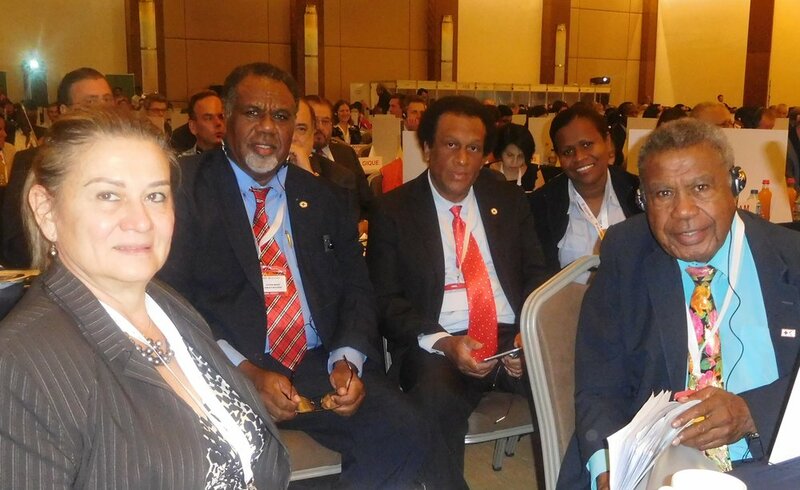 The Vanuatu Red Cross Society (VRCS) is being represented at the International Federation of Red Cross and Red Crescent Societies (IFRC) General Assembly being held in Antalya, Turkey. And on Monday 6 November, Vanuatu and other red cross societies from the Pacific stood together in supporting and successfully elected Italy Red Cross Society President Francesco Rocca to the position of IFRC President. “It is only normal that we support Italy because they have been talking with us about potential program support, similar to what they are already doing with other societies in the Pacific”, VRCS President Ati George Sokomanu said after personally congratulating Mr. Rocca after his successful election on Monday. VRCS Chief Executive Officer Jacqueline de Gaillande says “they have talked to us about support VRCS in first aid training programs for accidents and disasters happening in the sea. They have supported the Cook Islands red cross and we have discussed with them the possibility of partnering with them in a similar program for us in Vanuatu”. Mr. Rocca was elected by 178 national RCS presidents attending the IFRC General Assembly meeting in Antalya, Turkey. In his speech, Mr. Rocca paid tributeto the courage and dedication of Red Cross and Red Crescent volunteers around the world, and vowed to focus on ensuring they have continued and greater support. “We owe it to them to change and to strengthen our capacity,” he said. Mr Rocca’s election comes at a critical juncture for the IFRC and the wider humanitarian community. Aid organizations are responding to a range of complex and global challenges, and are struggling to respond to rising needs while balancing increasingly constrained budgets. The new President will play an important role in ensuring that Red Cross and Red Crescent National Societies can continue to support the most vulnerable and isolated. Meanwhile the meetings are continuing this week with different sessions taking place simultaneously on the various programs and aspects of the operation of IFRC. VRCS delegation to the important meeting include society President Ati George Sokomanu, CEO Mrs De Gaillande, VRCS Treasurer Moses Stevens, Organisational Development Coordinator Dickenson Tevi and VRCS Youth rep ElindaTaleo. The Vanuatu Red Cross Society is marking the 35th Anniversary of the Society today October 18 with the launching of its Strategy 2017-2020 as part of its celebration. The anniversary includes also a partnership meeting on October 19 and an awards dinner night by the President of the Republic of Vanuatu. “The Strategic Plan is the culmination of six months’ work and consultation with staff, members and volunteers, as well as stakeholders and communities,” a statement from the Vanuatu Red Cross Society reads. “The plan has 4 goals: save lives and strengthen resilience to disasters and crises; enable healthy and save living; promote social inclusion and a culture of non-violence and peace; build a stronger, safe sustainable, accountable and diverse national society. “These goals will help the Red Cross to achieve its mission: “To prevent and alleviate suffering by working with communities and partners providing quality humanitarian services to vulnerable people, in accordance with Fundamental Principles of the Movement”. The Vanuatu Red Cross Chief Executive Officer, Jacqueline de Gaillande, says the main change in direction will be the decentralization of Red Cross work from headquarters to the branches. “We will be driven by volunteers and members in our branches. “A strong branch network is critical for our sustainability and for our responsibilities to the Vanuatu government,” says Madam Jacqueline de Gaillande. Vanuatu Red Cross currently has 5 branches in the province of Torba, Sanma, Penama, Malampa and Tafea. The launch will be attended by government representatives, members of the diplomatic corps, friends and partners of the Red Cross, Vanuatu Red Cross board, management, members, volunteers and staff. Through the Coastal Cities Climate Change Adaptation project and working closely with The Sanma Provincial Government, NDMO and Luganville Municipality plus other stakeholders a working group, called Luganville Resilience Coalition was created under the SANMA Provincial Disaster Committee in June 2017 . In August, a training of facilitators was conducted by the Global Preparedness Center and external consultants to train members to carry out city wide assessment on community resilience through systems mapping of Luganville its communities and the effects climate change could have. The Trainees ranged from Municipal Planners to NGO workers. It is expected that the real-time assessment will be carried out by the Luganville Resilience Coalition under different SANMA Province clusters and with businesses separately. Already the mapping has shown an intricate web of systems in the town with more than 40 stakeholders ranging from the Harbour Master to the pikiknini who attends school - everyone has a role to play in the day to day activities of a functioning town. The mapping was commenced in September, but put on hold due to the people of Ambae requiring shelter, food and WASH support in Luganville. The Vanuatu Red Cross along with the majoritiy of the Luganville Resilience Coalition diverted their efforts to these more pressing issues. Vanuatu is one of the most vulnerable countries in the world to climate change and disaster risks. Our island nation experiences cyclones, storm surges, landslides, flooding and droughts, which may become more intense and less predictable in the future due to climate change. There is a need to educate and prepare the communities against these increased risks. In Luganville effects of climate change are already evident in the acceleration of coastal erosion on the main road by the new and old wharves, business district, and la plaçe. The areas of Pepsi at the shores of Sarakata River also experience a lot of flooding. Vanuatu Red Cross is honoured to be carrying out this project in conjunction with City and Government players. A city launch workshop was organized on Friday the 23rd June 2017 at the SANMA Provincial Headquarters for the COASTAL CITIES Resilience PROJECT. The day concluded with a speech from the Municipality Mayor and the Sanma Province Acting SG and 9 new signatories to the MoU for working together on building urban resilience. The project was endorsed by the NAB and NDMO in Vila in May. Vanuatu Red Cross Society with support from American Red Cross, Global Disaster Preparedness Center, IFRC and USAID have selected Luganville to pilot this exciting 18 month project. Luganville will represent the “Pacific” context, while two cities in Indonesia represent the “South East Asia” context. In second phase, the project would roll out in other countries based on our leanings. In Luganville, through this project, a sub-working group was formed to complement the Provincial Disaster and Climate Change Committee and will draw in wider support from local businesses, universities and other stakeholders in Luganville. They will undertake a city wide risk assessment will draw together existing knowledge and anchor the start of the work. The end result of the assessments will be a listing of priority risks facing local communities, households, businesses, community, and government structures in Luganville. Coastal Cities face a higher risk of exposure to flooding, cyclones and extreme weather events caused by climate change. Because of this higher risk, the traditional actions may not be enough. For this reason, the project will, target climate smart resilience and coastal risk reduction in particular. If you wish to be part of the project or assessments, please contact Jeff, the supervisor on luganvilleprojectsupervisor@redcrossvanuatu.com or come and see us in the SANMA Branch Office, on top of the Provincial HQ. or contact Benjamin Paget (Head of sub-delegates) on Mob: 7318268 / 5505304 or Priscilla Stevens (Human Resources support officer) on Tel: 26761 for more information.